Gold and Silver Stocks: It's Old Turkey Time! Those familiar with Jesse Livermore and the book Reminiscences of a Stock Operator know who Old Turkey is. He was Mr. Partridge, an old trader who dispensed great wisdom in few words. Those at the office nicknamed him Turkey because of the way in which he strutted around with his chest puffed out. Livermore gleaned wisdom from Old Turkey which included the importance of never losing one's position and placing the utmost importance on the major trend. "It's a bull market," he often repeated. Precious metals shares are breaking out again after a brief consolidation. It's time to channel your inner Old Turkey, realize this is a bull market and act accordingly. The evidence is overwhelming. After rebounding strongly to start the year, the mining stocks corrected through May. The June reversal on record volume created the first higher low. The miners then sustained that strength by closing the month and the quarter with the kind of strength not seen since the bottoming process began in June 2013. In addition to the price action, the miners have outperformed the metals in strong fashion and especially in the last five weeks. These are reliable signals of a new bull market. Analysts like to be cautious and sometimes prefer to avoid momentum plays but the charts lead me to believe that the momentum is building and has plenty of room to run. From time to time I've posted charts of my top 15 index. I wanted to create a much broader index consisting of quality companies with more of an emphasis on larger companies. The first image below is a weekly chart of my new top 40 index. It includes 28 gold stocks and 12 silver stocks. The median capitalization is nearly $750 Million and 15 of the companies are worth $1 Billion or more. The index appears to be breaking out after a two week consolidation. It closed Wednesday at its highest level in about 15 months. Note that although the index has advanced considerably in the last month and year to date, it is finally emerging from a reverse head and shoulders bottom that lasted 15 months! There is significant upside potential from the pattern and very little overhead resistance until the 2012 highs. 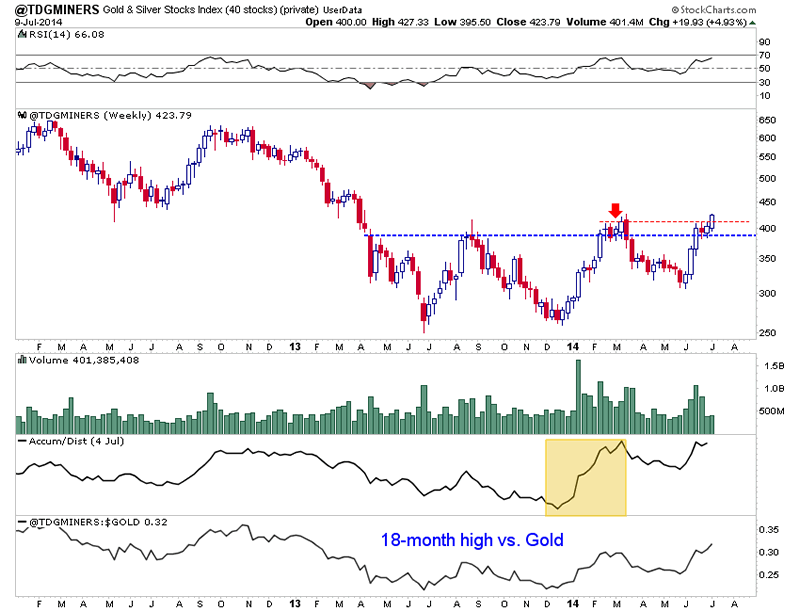 Also, note the huge accumulation during the winter and the relative strength against Gold. 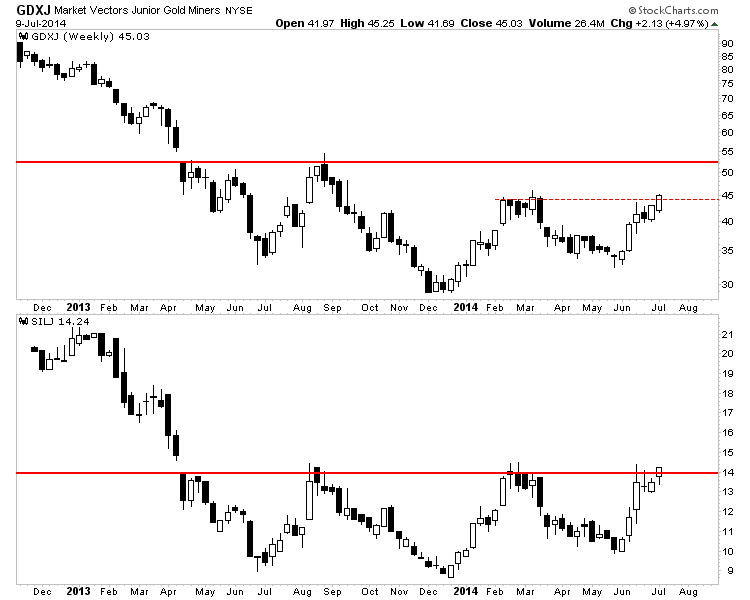 Staying with weekly charts, here is a look at the juniors via GDXJ and SILJ. With a bit more strength to close the week GDXJ will form a higher high and reach a 10-month high. The next resistance isn't until $52 while the next major resistance isn't until $70. Meanwhile, if SILJ closes the week at the current level then it would mark the highest weekly close in 15 months. SILJ is starting to breakout from a very well defined head and shoulders pattern which projects roughly 30% upside from Wednesday's close. In February we argued that the strength in precious metals should not be feared and that there was plenty more upside ahead. That article was premature as its points appear to be more instrumental right now. This is a tough time to buy as miners are no longer dirt cheap and have already rebounded quite a bit. At the same time, there could be a lingering fear that the bear could reassert itself at any moment. That article provides some examples of how markets performed following major bottoms. The rebounds (in miners and general markets) tend to last well beyond one year before there is any significant correction. The final bottom for miners was in December 2013 and further strength in the coming days and weeks should provide us absolute confirmation. Though the miners have already rebounded significantly, the charts suggest that there is plenty of additional upside potential directly ahead. How do you play it? Focus on quality stocks that are not so overbought and take advantage of dips (5%-10%) when they come. Have an exit strategy just in case and then channel your inner Old Turkey! If you'd be interested in professional guidance in this endeavor, then we invite you to learn more about our service.